Don't use this book as your primary study method. Rather, use it for the last 4 hours leading up to your test. It makes for a great review right before the test. I passed the CCNA on my first try. (I used Testout Labsim CCNA and the CCNA Press books as my primary study method). After listening to this book I have come to realize that a companion (real) book is nessasary to fully understand what is being taught. Sense I am taking a course in Cisco systems CCNA, I understand what is being said and taught by the narrator but would be lost if I was not attending night school. The book only highlights some of the things that are necessary to know before taking the certification exam. I feel that if a person only relies on this audio book to pass the tests, they might be surprised that they may need a lot more training than this book offers. This is a good book to refresh one's self on the subjects that are being taught in classes offered by Cisco, but it is NOT a substitute. This helped soo much, I'm soo happy to have found this audiobook. Please Please keep doing these tech books! I would like to see other certification books and just computer books in general. Great stuff!!! This audio book is really great!!! Something a networking professional/ continuing education student will listen to over and over again. Grrrrrrreat!!!! This is extremely well delivered. This CCNA listen is very well laid out and will help immensely. 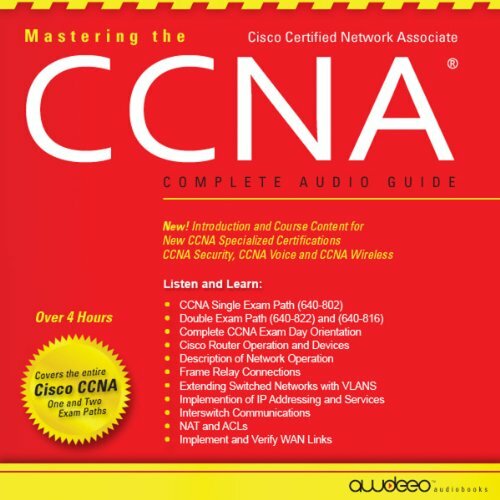 "Knowledge only becomes Intelligence when it is APPLIED"
This audio book covers all the points for the CCNA. The audio is fluid and transitions very well. DO NOT USE AS YOUR ONLY STUDY GUIDE. this book has very high level overview information. it does not go into detail about anything. I would recommend reading this book at least 3 times, just to get a basic understanding of what the test covers. then I would use another study guide for detailed info. to reiterate: this book does not prepare yoy for the CCNA.